Workplace worries are something that will definitely come along, for both sides of the coin: You’ve got the intense workplace worries that employees feel everytime they walk into the door, and you’ve got the worry the side of the coin that people forget about, the company owner worry. It’s so easy for a workplace to turn into something that’s just so unproductive, and isn’t bringing in the profit the business needs, purely because the environment just doesn’t suit the company. But on the other hand, it’s so easy to get your office up to scratch, and turn it into something that people actually want to come and work in. If you take a bit of time and money to invest in a workplace project, we just know that your business won’t regret it. But the workplace is often the last place that businesses take the time to look, and it really does reflect when you look at reviews of the company, and staff turnover. So, if you know your companies workplace just isn’t up to scratch at the minute, we’re here to help. We’ve got some common worries and issues that people have, and how we think you can get around them. When your team doesn’t gel properly, your company is just going to go downhill instantly. It’s so important to have a team working for you that get on, are able to communicate, and that are able to keep the issues to a minimum. Some offices are a total school playground, with arguments and affairs going on around every corner, and it just doesn’t create that healthy office environment. Aside from disciplining them constantly, there’s nothing much else you can do apart from giving them the sack, which you might very well have to do if you know you’re struggling to get a good working environment. But then you’re left the with problem of having to replace someone, and that’s often the reason why company owners are always so reluctant to get rid of their staff. But to make sure you get the right person, you could always think about going through recruitment agencies such as A&S Recruitment, and have the best team behind you. As long as you have that team that gels together, you know you have something strong to rely on. You don’t want to spend your time mothering a group of people, a strong team will just know what to do, and take all of the hard work out of it for you! We’re not talking about the warning signs being boring, we’re talking about the warning signs that mean your office is turning into a boring place to work, and then you really can’t blame the lack of productivity that you feel your employees are giving you. The warning signs are, an office where people are barely talking, and you don’t really feel a buzz from it. An office where people are calling in sick or leaving rather quickly, people don’t actually get sick that often, so it’s definitely a warning sign. And if you catch people staring into space, or not really doing anything, it can be such a big warning sign of boredom, not just that they’re not doing the work. So to get the motion rolling again, and to bring a little bit of fun back in, you’re going to have to put some solutions in place. Allowing your employees to talk freely, and to wear what they want into the office is step number one. Then, you could put a TV in there, and have it playing whatever they want all day. If you know they’re doing the work at the same time, it can be such a good mini distraction for them, that will actually keep them concentrated all day. It’s no good trying to get someone to stare at a screen all day and hope they stay focused, they need something fun and seperate to work, that will allow their mind to stay occupied. 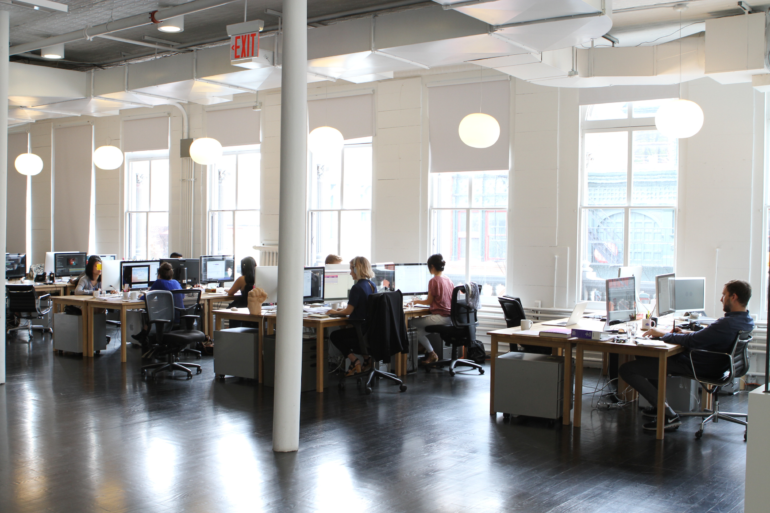 The layout of your office is actually going to make a big difference. You want to try and get it so that everyone is close to each other, but no crowded on top of each other. There are actually articles on the internet that will show you how to get a more sociable office space from the layout, just have a quick Google and see what you think. But as well as making sure everyone is in the right place, you also need to funk up the office a bit. Bring in some big indoor plants for some colour, and think about putting your logo on the wall, or putting some wall art on to make it nice and funky!